I had some book illustrations and book covers in an exhibition. 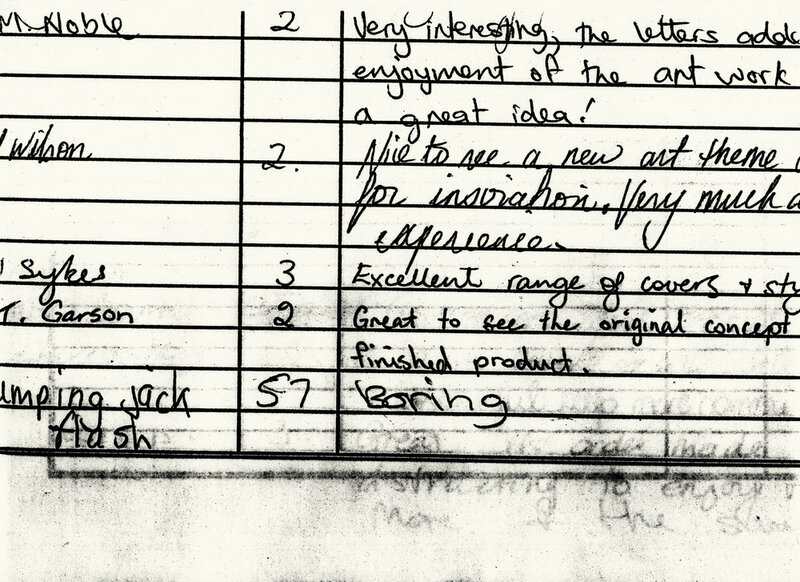 There was a Visitors' Book at the door and writing comments on the show was encouraged. Children can be polite and brutally damning in equal measure. Some write what they think they should, others just seem polite, and then there's ones that, after looking at what everyone else has written, intentionally write the most extreme opposite just to make things interesting. These usually make the best reading. I'm talking about you, Jumping Jack Flash. If I go to a museum, house, hotel, historical building or exhibition and am asked to sign such a book, I panic because I sometimes don't want people to know what I think. Just because I wasn't impressed by it shouldn't mean it should be recorded in my handwriting for eternity. I've been to museums where Visitors Books themselves are on exhibit to show what people have said about something or other 200 years ago. Or a hotel register showing that Napoleon or Neil Diamond or someone has stayed somewhere sometime. And people are worried about whether one's online presence can be erased.